On left is Asa W. Whitney and his wife Mary A. Wrightman Whitney. Asa W. Whitney was a son of Milton and Lydia Cleveland Whitney. Mary was the daughter of Oliver and Edna Wightman. The first white men ever known to have been inhabitants of this township were a man by the name of Baker and his two sons. As early as 1812 or 1813 they cleared a small spot of ground on the northeast corner of lot ninety six and built a log cabin. They remained here for some time but fear of the Indians and the British soldiers who were at that time scouring the country induced them to leave. The Father is known to have gone into the army of the United States and whether his sons also entered the military is a matter of conjecture. They remained in the vicinity some time after his departure. It is not improbable that these men made the original survey the township. A fact pointing to this conclusion was the discovery of a lot of surveyor's instruments in their cabin a number of years after they left. They were also mentioned as surveyors in some of deeds given the first settlers. (1989), Vol. 2:1477 #3163 Elyria Courthouse and US Census 1830- 1880 Pittsfield, Lorain, OH. Thomas Waite settled in Russia Twp. while his sons settled in Pittsfield. Milton Whitney came from Pittsfield, Massachusetts, in 1820, the year after the Pittsfield Township survey had been made. He purchased a large tract of land in the developing township. ( Williams Brothers, ﻿History of Lorain County 1879﻿, Philadelphia; pg 579 - 580). There were three Whitney families that settled in Pittsfield Twp., Ohio; Milton Whitney, Nathan Whitney, and Joseph Whitney. All were descendant's of John Whitney, who migrated from England to Watertown, Massachusetts in 1635. Therefore, Milton Whitney and Joseph Whitney were distant cousins. Photo above: Sons of Joseph Whitney (1785 - 1877 arriving in Pittsfield approx 1833) from Westminster, Massachusetts. Pictured are the sons of Joseph Whitney: Mark Whitney and his brothers Josephus, Aaron and Augustine. This is what was left of the center of town after the April 11, 1965( Palm Sunday) tornado that hit Pittsfield Twp., Ohio. We are still gathering up the pieces. The 50th Commemorative Anniversary was April 11th, 2015 whereas a plaque was dedicated to the residents who were killed in the tornado. The plaque is displayed at the Township Hall. About 250 people attended the Ceremony. was located on the site of the current Pittsfield Community Church. Landmark and dedicated to those who fought to preserve this Great Union. This is the Statue Landmark whereas the figure was knocked off the granite block during the '65 tornado, reconstructed after the tornado, but facing the wrong direction. The Statue was re-worked and turned in the original direction it stood prior to the tornado. This is as it stands today. 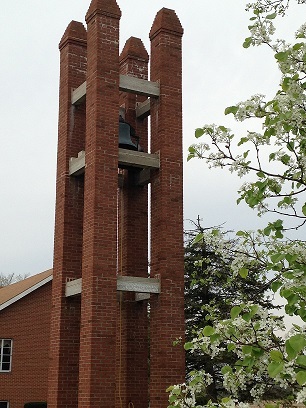 The Bell Tower was constructed after the Palm Sunday Tornado of 1965. It is located on the current Pittsfield Community Church grounds. 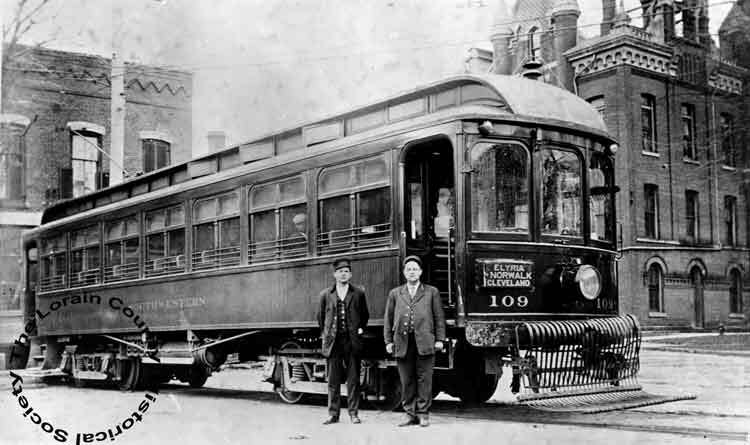 Inter-urban Street Cars that ran between Wellington and Elyia, connecting with other lines in the northern part of the county during the late 1800s and early 1900s. 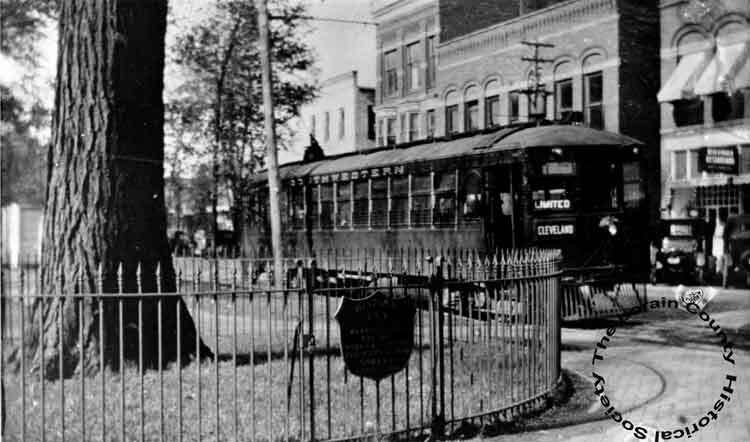 The "Green Line" was part of the Cleveland and Southwestern Co.
Mr. Winfield Avery, a lifelong resident of Pittsfield was a conductor on the Green Line when on Memorial Day 1907 a trolley car accident occurred on Middle Avenue in Elyria. Mr Avery lost both his feet in the accident, but survived to live a long productive life here in Pittsfield. For many years Mr. Avery served as Township Clerk. Trolley Cars otherwise known as 'Interurbans' that travelled from Cleveland, Elyria, Oberlin and through Pittsfield, stopping at various points on Rt 58. 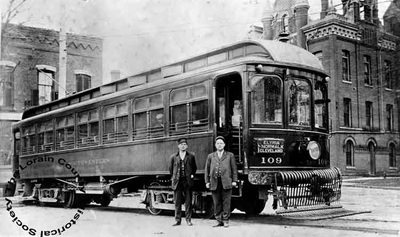 Photo; Courtesy of Lorain County Historical Society. Reproduction of the book; Williams Brothers, ﻿History of Lorain County 1879﻿, Philadelphia, has been made possible through the sponsorship of the Genealogical Workshop Lorain County Historical Society Elyria Ohio. All of the original school houses in Pittsfield Township were of log construction. The exact location for the first school house in this area of the township is difficult to determine. We do know that at one time a school house was located approximately one-half mile west of the location of this school, on Original Lot 17, the north side of Kipton-Nickel Plate Rd, just west of Hallauer Rd. We also know that the current location of this school in 1858 was leased to the Pittsfield Township Board of Education from Eliza McRoberts for $20. In 1881 Henry McRoberts sold the property to the board of education for $41.87. It was quite common in those days to name the school after the family who either sold or leased the property to the school board. Hence this school became known as the “McRoberts School”. How many previous school houses existed at this location is unknown. On July 2, 1891 the official school records indicate that Pittsfield Township Special District No. 2 was officially formed by submitting a petition to the township board of education, as per Section 39-46 of Ohio School Law. The area of the new special district consisted of Township Lots 1,2,3,4, west half of 16, the whole of 17,18,19,20,21,22,23,24, ten acres in the NE corner of 36, and the whole of 37, thirty acres in the NE corner of 38, and the whole of lots 39 and 40. At this same time an election of officers was held with W.S. Bitely, Chairman and Pitt McRoberts, clerk. The first school board consisted of Francis Barnard, Volney McRoberts, Walter S. Bitely and Clinton Hanmer. It was also decided at this time to ask for 6 6/10 mills tax for support of the new school, and plans were discussed regarding construction of the new school house shown above. By the July 11, 1891 meeting of the new school board, construction plans for the new school had been drafted and they were ready to ask for bids. Two prospective contractors responded to their request for bids. L.H. Pierce of Wellington and Charles Glenn of Oberlin. Both bids provided for an option on the roof materials, either a slate roof or a shingle roof. Mr. L.H. Pierce was awarded the contract at a total bid of $1,689.50. This included the completed building, with slate roof, interior black boards, and school bell. On July 27, 1891 the school board put the sale of the old school house up for bid. A. McRoberts bought the old school for $48 and H. McRoberts bought the wood storage house. This current brick “McRoberts School House” served the residents of Special District No. 2 from 1891- 1940, when this portion of Pittsfield Township was consolidated with the Oberlin School System. In 1940 the school house and property were sold to Ralph E. Cain for $420. The property is currently owned by Mr. & Mrs. Ned and Dianne Gott. An Historical Event Commemorative of 50 years. In the process of dividing the land amongst the group of investors it was decided that $26,087 would be required to purchase a township, therefore this required some of the individual investors to pool their money in order to acquire a whole township. It wasn't until 1806 that the surveyed meridians and parallels were run for what was known then as Range 18 Township 4, and later named Pittsfield Township. The township was laid out in a five mile square, or five miles on each side, thus giving the township sixteen thousand acres. This land was then divided into one-hundred and sixty 100 acre lots. *see original map on our Home page. In a draft held at Hartford, Connecticut on April 4, 1807 the following individuals became the first owners of Pittsfield Township: Elisha Tracy, Lewis Devotion, Joseph Barnham, Richard McCurdy, Samuel Dorrence, William Perkins, John McClellan, and J. Ward. These men in common held title to all the land in Pittsfield Township. At this time the State of Ohio was only four years old and the State Supreme Court Judges traveled all over the State holding court where it was necessary. The court at this time had jurisdiction over many matters including the partitioning of such real estate among joint owners. During one of these settings the owners of Pittsfield filed a petition to have the court set off to each owner his acreage according to the amount of money he had invested in the purchase of the township. The result of this suit was that the following number of lots were awarded to the men designated: Elisha Tracy 75 lots; Lewis Devotion 20 lots; Joseph Barnham 9 lots; Richard McCurdy 21 lots; Samuel Dorrence 12 lots; William Perkins 13 lots; John McClellan 4 lots; and J. Ward 6 lots. Original Pittsfield Township Lot No. 95 was one of the lots Richard MCCurdy owned. Of those original land owners, many never saw their property here in Pittsfield and many saw a slow return on their investment. Many of their holdings still existed when they died and were inherited by their heirs. Lorain County was officially not established until 1824, therefore our records begin on this date. From 1824-1835 deed records indicate that Richard McCurdy owned Lot 95, containing 100 acres of land. The property was valued at $274. In 1836 Richard McCurdy sold the 100 acres to Artamus Hamlin who owned it until 1838. No records exist for the year 1839. By 1840, Artamus Hamlin had sold 97 acres of the property to Ithael Tuttle, and 3 acres to Washington West. This three acre parcel appears to have been on the north-east corner of the property. Ithael Tuttle continued to own his 97 acres until 1850 and Washington West owned his 3 acres only until 1842.In 1843 Washington West sold his 3 acres to James Duel, who owned it until 1848, when he sold it to Seth Root. In 1851 Ithael Tuttle sold his 97 acres to Ephraim K. Avery and Seth Root sold the 3 acre parcel to Elva Ranny. In 1854 Elva Ranny sold the 3 acres to W.G. Hitchcock. In 1854 Ephraim K. Avery sold 47 acres from his 97 acres to Edwin K. Avery. As of this date Ephraim K. Avery owned 50 acres in the south side of Lot 95, Edwin K. Avery owned 47 acres on the north side of Lot 95, and W.G. Hitchcock owned 3 acres in the north-east corner of Lot 95. Since the topic and the subject of this writing pertains to the history of the Marshall Farm, I'm confining my record to the ownership of the south portion of this lot. Edward Matcham. In 1872 Edward Matcham sold the south side to John C. Marshall the subject of this writing. It is interesting to note that the 3 acre parcel has disappeared from the tax records by the late 1850s. John C.Marshall continues to own the south side of Lot 95 until 1916 when it was sold to Henry Pitt & Mary A. Marshall Campbell. Mary was a daughter of John C. Marshall and Ann Knapp Marshall At that time the county tax records indicate that it contained 42.5 acres of land valued at $5575. It is also interesting to note that the 50 acre parcel of the south side is now 42.5 acres. In 1919 the property had transferred to LeRoy (Roy) and Clara A. Campbell Brasee daughter of Henry Pitt Campbell and Mary Marshall Brasee. The property is currently owned by Jerry Brasee, a grandson of Leroy (Roy) Brasee and Clara A. Campbell Brasee. Back Row from Left: Mark Deidrich, Forrest Mohrman, Mark McConnell. Photo current event, Tari Deidrich steps down as fiscal officer, Mandy Ceicil sworn in.